Abstract With the start of the negotiation processes of the EU-Turkey deal in November 2015, the first batch of Syrian unaccompanied minors, residing in a child and youth support center in Istanbul under state care protection, were transferred to a refugee camp by the (Turkish) Ministry of Family and Social Policies as part of preventive measures taken to secure the European borders. After having to spend a few weeks in the refugee camp, some of the minors chose to escape from state protection, in which they would have otherwise been locked up until the age of 18. By accompanying the minors during the events taking place throughout the ethnography, I explore the diversity of state rationalities, tensions, and contradictions existing between conceptions of rights and duties. I argue that this ambiguous moral configuration within various state agents leads to greater confusions (Fassin 2015), and leaves an open space for minors’ agencies to emerge as a response, particularly at times of sudden structural changes. The state’s shifting treatment towards the Syrian minors and their overall relationship, will be observed from a perspective of what I will call ›confused moralities‹ practiced by the state — the police, social workers, gatekeepers, and teachers. Through youth participatory action research, I explore how seeking freedom has been exercised (Laidlaw 2002) by these minors in terms of their agency, in the context of escaping from exclusion (from becoming child soldiers, from imprisonment in Syria, and from detention in the refugee camp in Turkey) and in reclaiming their inclusion back into the institutions of state care through schooling. Mazen had a mischievous smile on his face as he looked at the camera with great curiosity and enthusiasm. His hair kept falling on his forehead, blocking his vision. In order to see clearly, he had to lift his head up all the time. Realizing Mazen’s funny situation, Yaman comes and drags him by his shoulder. They start a quarrel that makes everyone around them laugh. Their quarrel was about who would be the first one to use the camera.1 Both Mazen and Yaman were from Aleppo, and 15 years old at the time that we first met in October 2015 at the yard of ÇOGEM,2 (Refakatsiz Mülteci Çocuklar için Çocuk ve Gençlik Destek Merkezi), the child and youth support center for unaccompanied minor asylum seekers in Istanbul. Then Mazen left us to play soccer with the Afghan minors who were getting ready for their tournament in the front yard of the youth center. Ali made a photograph of the moment; he captured Mazen entering through a hole in the playground fence. This moment, seen as escaping by Ali, would actually become true once and again in the lives of Mazen and the Syrian minors as they escaped from their war-torn country and later on from the refugee camp in Turkey. Their crossing repeatedly manifests itself in different spatial and temporal grounds upon their arrival to Turkey, and beyond their stay, as the minors continuously have to escape detention and police interrogations. By following the lives of the Syrian unaccompanied minors throughout the year, and being inspired by Ali’s photograph on »crossing the fence in order to play,« in this paper, I will explore the act of ›escaping‹ from various life-threatening conditions, moments, and situations that prevent minors from participating in daily life, and that deny them the rights to access education and other social services as well as, lastly, childhood in general. I discuss how crossing the fence manifests itself, not only as an act of escaping from state control, but also as an act of reclaiming ›freedom‹ in relation to minors’ agency. Following Arendt’s view on the intimate links between freedom and power (1972), I link freedom, agency, and the moralities of state agents. Building upon recent anthropological debates on morality (Zigon 2007) and ethics (Laidlaw 2002), I look at how state agents try to act morally and become ethical subjects (Fassin 2013: 249). Without having to approach the state agents as rational or strategic actors driven by power and interest, I join Fassin as he states, »the boundaries between the moral, the ethical and the political are empirically more confused than what one usually believes« (Fassin 2013: 249), since they all remain in between treating, receiving, and profiling the minors as children, refugees, guests, Syrians, the innocent, criminals, weekend fighters, terrorists, fugitives, and in local terms as mazlum (oppressed, downtrodden). However, in this paper, I will show how such categorizations result in minors escaping from these invented figures. Throughout the paper, I explore how — prior to the EU-Turkey deal — the state care facility agreed to provide access to education and social services to minors in Istanbul, and how later on — after the deal — the facility denied them access by keeping minors outside the sphere of social interaction by transferring them into an enclosed refugee camp in Adana. From there, most of them escaped as a way to resist exclusion, marginalization, and further criminalization. It is therefore particularly important to highlight that the processes of the EU-Turkey deal stand as a life-changing event, as minors were forced to reject state care protection and follow different pathways in life at the age of 15. Crossing the fence in order to play, made by Ali (Somalia, 17) on 27th of October 2015, Istanbul. The access4 provided (October 2015 to March 2016) to the field site included the making of a radio show program5 and photography elicitations6 within the state care facility and outside in the neighboring areas. In the beginning, the research was conducted in a structured yet informal manner. The radio program participants provided me with most of the relevant themes, as they were continually and actively involved. My major task then became to ensure that there was enough free space for the multiple voices to emerge within the radio sessions. As such, the radio program facilitated the collection of past and recent memories on stories about escaping from exclusion. However, after their detention at the refugee camp with the introduction of the EU-Turkey deal in early November 2015, there was a methodological shift in our approach, as all of us were expelled from the state care institution. I found myself moving towards what is widely known as youth participatory action research7, as I accompanied the minors over the course of these actual life-changing events. The involvement of the youth in participatory action research emerged out of the necessity to address the stress, constraints, and exclusion they were facing on a daily basis. Especially through the photography elicitations minors were able to interpret and communicate personal stressors that provoked critical thinking and further enabled problem solving. The ethnography therefore showcases minors’ own photographic self-representations in spaces of their own making, not in structured settings but in spontaneous moments during our interactions and time together during the events taking place (police interrogations, transfers to the refugee camp, searching for education). In collaboration with the refugee youth and with fine-grained attention to the in-the-moment cultural productions and learning within those spaces (Wissman et al. 2015: 187), life events and stories will be presented over a time period that involves the processes of the EU-Turkey deal — starting from early October 2015 to November 2015, when the deal was formally acknowledged, and in March 2016, when the deal began to be implemented. Before the introduction of the new directive (Yönerge) by the Directorate General of Migration Management, Syrian unaccompanied minors were referred to the Children and Youth Center Directorate (ÇOGEM) alongside Afghans, Somalis, Iranians, Iraqis, Palestinians, Congolese, and many other nationalities. The center, which is under the management of Istanbul Social Services, has been functioning since 1998, and has been mainly for male children living on the streets. In 2008, with the increase in the numbers of unaccompanied asylum seekers coming to Istanbul, the center’s function was changed to supporting unaccompanied minor asylum seekers and its capacity increased from 40 to 60 locations, administered by the Family and Social Policies Ministry, and is for 7-year-old to 18-year-old male children. The center is described as particularly being for those who have been neglected and exploited by their parents and who remain unprotected in the face of dangers: children who live on the streets and unaccompanied refugee children who have left their countries. On March 18, 2016, Turkey agreed to accept receiving migrants deported from the Greek Islands due to the EU-Turkey deal (European Commission 2016). And on March 20, the management of ÇOGEM told me that things were out of control and that they no longer had a hold of what the volunteers were doing, that they were not ready to receive so many returnees from Europe,9 and that they were under extreme stress. Their concern also had to do with their lack of capacity; they did not have enough beds and space for the possible newcomers. Syrian minors were temporarily being held in ÇOGEM, but in the eyes of the law they were not officially perceived as refugees (as they were still described as ›guests‹). And indeed, once again they were removed to the refugee camp and were replaced with the incoming Afghans and other nationalities. 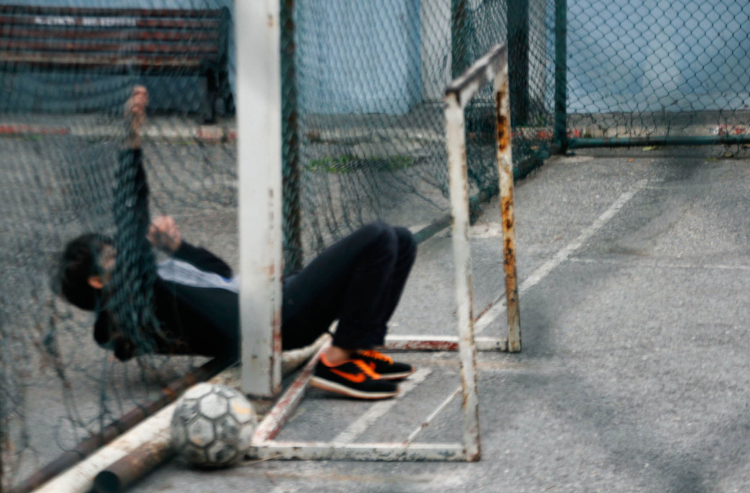 Exclusion is a process that needs to be stressed, since it covers the workings of social mechanisms and the recognition of situations created earlier for which no solution has been found, resulting in what Jarrett Zigon calls »moral breakdown« (2007). According to Zigon, moral breakdown is a moment of problematization10 and is an ethical moment (ibid. : 138). He makes a distinction between »morality as the unreflective mode of being-in-the-world11 and ethics as a tactic performed in the moment of the breakdown of the ethical dilemma« (ibid.). Here, the ultimate moral breakdown would be the EU-Turkey deal, which fostered minors’ transfers to the refugee camp as a process that started in October 2015. The deal was the culmination of events that took place in the summer of 2015, when Aylan Kurdi’s image went viral, resulting in emotional explosions around Europe and the Western world, and that led to German Chancellor Angela Merkel’s announcement that she would open Germany’s borders (Fernando/Giordano 2016). Thereafter, the announcement of a temporary welcoming policy prompted one of the biggest marches of migration from Turkey and Greece towards Europe. Months later, the German state’s performed tactic, resulting out of an ethical dilemma concerning an appropriate reaction towards the incoming migration movements, manifested itself in the closure of its borders — a process that also resulted in the end of Turkey’s open border policy towards Syria. The EU-Turkey deal forced Turkey to take restrictive measures to have control over its own borders. No longer could Syrians from Turkey leave for Europe and Syrians in Europe came back to Turkey. As such, migrants continued to contest the ambiguities and contradictions in the political-legal spaces (Santer/Wriedt 2017: 149). In this ethnography, the state includes different actors: staff members of the social policy ministry, social workers, teachers and gatekeepers (bekçi) of the Children and Youth Center Directorate (ÇOGEM), and the children’s police. Each of the agents has different motivations for exercising power; in integrating or excluding people, they do not act as a unified entity. Being composed of different people, the state is the product and the determiner of both policies and practices, and hence looking at the values that are embodied by it denotes how it behaves like a moral agent (Fassin/Kobelinsky 2012: 448). I would initially argue that it acts as a confused moral agent, since each actor does not decide similarly according to their moral obligations, duties, desires, drives, and inclinations. A reverse shift in policies often leads to contradictory responses, which state rhetoric must respond to; personal values, compassion, and conscience clashes with the expectations and interests of shifting transnational rationales — the political, legal, and managerial dynamics of structures and the terms of their relationships. The constant swing from humanitarianism to security and vice versa leads to an increasing confusion between the two (Fassin 2005: 362). Therefore, in order to better explain the contradictory and confusing scheme of how each state agent plays a different role and makes different ethical choices, I would coin this pluralism and its paradoxical nature as ›confused moralities‹ produced by various state agents. Confusion will be exemplified and defined in relation to 1) how the multiplicity of state agents creates multiple moralities that result in a variety of misinformed and confusing practices, and to 2) how an agent’s morality becomes confused as a result of the sudden changing context caused by the policy shifts. The former is more about the multiplicity of state agents’ practices and the latter is more focused on individual responses (meaning, it is not to be defined as entirely self-conscious or autonomous). In the case of Syrian minors, their reallocation to the refugee camp marked how security became prioritized over children rights. Minors’ rights were overshadowed by the new shift in policies, which often functioned in arbitrary ways and resulted in the violations of their rights. Such process of confusion leaves an open space for the ›agentive counter-arguers,‹ as I will additionally call them — the Syrian minors and me as the researcher, who positions herself beside the minors. Hence when objected to forced resettlement to the refugee camp, the agentive counter-arguers found ways of contesting the ambiguous moral configurations of the state and produced counter-solutions by arguing with the state agents and taking action to search for opportunities to exercise freedom. Moreover, I showcase how truly excluded the Syrian minors felt from the categories of ›civilized and moral beings‹ throughout their struggle, and how they looked for ways for being reincluded into the state care facility. 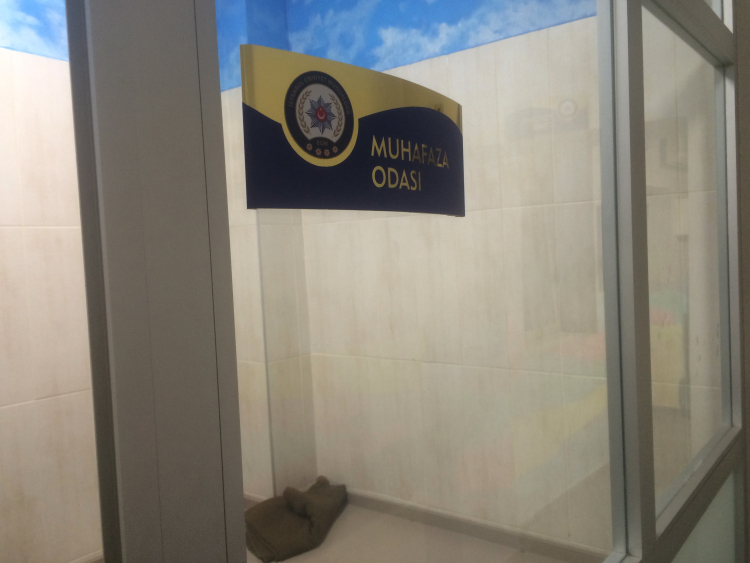 Muhafaza odası at the children’s police center, about 5 m2, with a ceiling painted like a sky with clouds. Photographs by Eda Elif Tibet. Since understanding agency in terms of moralities is essential, understanding the possibilities of human freedom in relation to the anthropology of ethics is just as important. James Laidlaw argues that it thus requires further ethnographic description (2002: 315). In an attempt to address the lack of theoretical reflection on the nature of ethics in anthropology, throughout this paper I describe various ways the search for freedom has been exercised by these minors in the context of escaping from exclusion and reclaiming their inclusion back to ÇOGEM by: 1) escaping from the refugee camp in Turkey, 2) escaping from becoming a child soldier in Syria, 3) escaping from imprisonment within Syria, and 4) Claiming education. During the crafting of the EU-Turkey deal in November 2015, unaccompanied Syrian minors were transferred to a space of their own in the form of a single big tent within the camp that would accommodate up to fifteen of them, both males and females. Spending two to three weeks in the refugee camp, Mazen, disliking his new living environment, escaped from the camp and brought a new friend (Burhan) along with him back to ÇOGEM. Escaping the refugee camp could be seen as an attempt to contest the migrant children regime that has been established without the minors’ consent or participation in the decision-making. According to the minors, remaining in the refugee camp was no different than being imprisoned. Mazen then came up with many questions: »What have I done to be sent there? What did we do wrong? Why did they punish us? Why don’t they like us, why?«. According to him, imprisonment had something to do with punishment; however, it was not about an offense or crime he had committed, it was for a crime that he might commit in the near future. In my own assumption, their transfer to the refugee camp was not for punishment, rather for prevention. After all, the EU-Turkey deal was mostly about preventing refugees from crossing the seas into Greece and making it to European territory (JRS Europe 2016). With the introduction of the EU-Turkey deal, the unaccompanied Syrian minors suddenly became the undesirables and were to be kept in a small territory of exception — the camp (Fassin 2005: 379), as a practical solution to maintain the integrity of the European borders. This is what Burhan told me a few weeks after we started doing the radio shows and photography workshops together. He told me how confused his mind is, and in many instances he was not able to control his temper. In one of our radio sessions, while we were waiting for Ali to arrive (our program presenter and translator, Somalia, 17), I was with Burhan and Yaman (Aleppo, 15) in the radio. Burhan’s Turkish was still very basic; he tried telling us how he managed to escape, together with Mazen, from the refugee camp where he stayed for two and a half months. He tells us how he was kidnapped by ISIS from his home one day and taken into Iraq, close to a border town with Syria, where he got his first training, but that he had found a way to escape as he did not like the treatment. Although Burhan still seemed to follow a moral code imposed by a fanatic religious group (ISIS), he demonstrated being a free ethical being (Foucault 1977; Williams 1972): he chose to escape. He wanted to have the freedom to make choices in regard to his appearance and thoughts, and, more importantly, he wanted to be accepted into his new host society. After hearing Burhan’s story, we later on gave the microphone and the headphones to Yaman, who also told us his own story of escape. Yaman then sang a song for his mother12 on the radio asking: »What is this war for my dear mother, isn’t it a big sin (günah), isn’t it enough, when will this end?«. For Yaman, freedom was about disobeying structures of control and this disobedience happened to become a revolutionary act. Yaman always demanded to be his own self, but how much of the revolution he took part in back in Syria was of his own choice, is questionable. Although agency raises the question of whether people’s choices are genuinely their own choices (Laidlaw 2002: 315) — even if not their own choice, it should be considered as a step towards choice making; and this not necessarily on an individual level but also within a collective effort. »Freedom is a function of how much a person is left with, by his overall context, human and natural« (Carter 1999), as it is a choice if someone is left with by other individuals (Berlin 1969). So, also minors revolted against ÇOGEM, as the new policy restricted their access to adequate social services and to education. The minors requested that they get enrolled into formal schooling so that they would not be sent back to Adana. Social services agreed to their request, as they seemed positive about giving them a second chance. The social services within the facility also accepted my support and assistance in finding them a good fit. However, the order to have them sent to Adana was from the ministry, and they were not sure how long they could prolong the minors’ stay in Istanbul. The social services staff thought that the educational and social services would be much better in the camp. However, due to a few unfortunate events and a misunderstanding between the school principal and the minors, no formal schooling ever took place. After his two nights on the streets in solidarity with Mazen, I managed to convince Yaman to go back to ÇOGEM. Yaman’s documents had not yet been transferred to Adana and he could still stay in Istanbul. Following procedure, we had to go to the children’s police to get Yaman readmitted. Mazen ran away as he feared that he would be treated badly by the police, recalling his previous unfortunate experiences. This whole situation had deep psychological effects on Mazen, and he started cutting himself all around his arms and legs; Yaman started doing the same. Although being quite scared too, Yaman came with me. There were two children’s police centers (çocuk polisi)13 that I could take him to, but Yaman did not want to go to one of them as he feared bad treatment. He said that the police had kicked him there before. The police looked at Yaman and said: »You are not a criminal, you did not commit a crime, no one can kick you, don’t be afraid.« However, according to the social services in ÇOGEM, Yaman could be a criminal, as the staff member says: »This center is a place where the innocent and the criminals live together.« Yaman was then placed in a small room called muhafaza odası14 where he was asked to wait for his readmission to the facility. I sat next to him in the room. 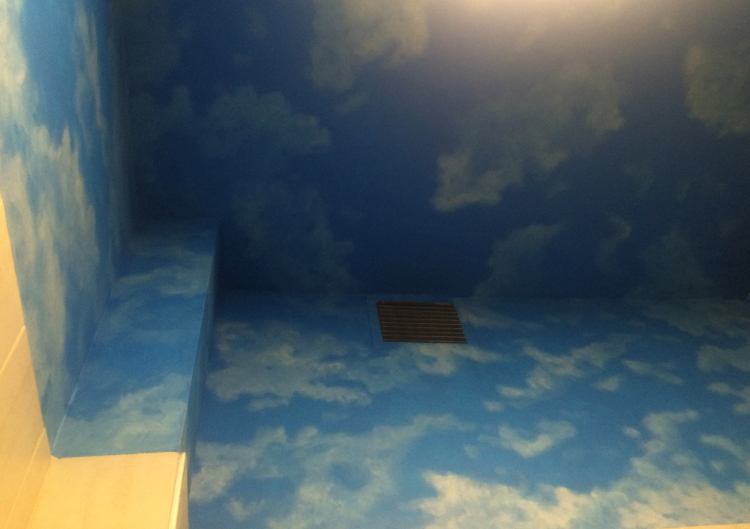 At some point, we looked at the ceiling above us and noticed that it is painted like a sky with clouds. Perhaps this was done in an attempt to make it look like a child-friendly space or to make such a claustrophobic space seem more spacious. A seagull flying over the sea. 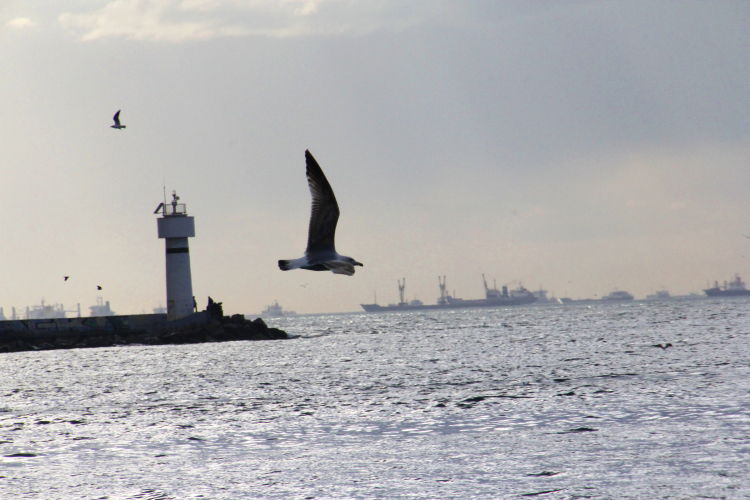 Photograph taken by Burhan (Mimbic, 15) at Kadıköy, Istanbul 2016. Hence, as part of his duties, being the children’s police, being obliged to protect the rights of the minors, the policeman was aware of the obligation of having to take back the minors into the facility. This was not the case with the social worker during the night shift in ÇOGEM who stayed uncooperative. Only the gatekeeper guarding the facility at the entrance helped us to re-enter. Also, previously he had showed us the way and suggested that we use the police force for getting the minors readmissioned. He did not like that the minors had to sleep outside, as he said about Yaman once: »This one has the heart of gold, a very genuine and nice child he is, but just because of his temper he keeps losing. He better learn how to behave, otherwise he is doomed to live a hard life.« While the social worker refused to take back the minor, the gatekeeper did, as he pitied the youth, creating a situation that oscillated between both sentiments of sympathy and a concern for order — minors were caught between a politics of pity and policies of control (Fassin 2005: 366). Similar to the night shift teacher, the social worker was also demonstrating a moral manifestation inclined towards the institutional interests with which the idea of ›not building a relationship‹ came into the scene. According to the staff member, building relationships is problematic as the minor refugees there cannot be seen as individuals, but rather should be seen as a clan; as a whole. His views are a reflection of the general refugee policy in Turkey, which does not accept Syrians as individuals but sees them as a ›mass influx.‹ This is reminiscent of how Zigon relates »moral breakdown« to the importance of relationships (2007). Zigon further claims, »when something breaks down, it becomes disconnected from its usual relations in the world« (ibid. : 138), and »the ethical subject no longer dwells in the comfort of the familiar, but rather stands uncomfortably and uncannily in the situation-at-hand« (ibid.). Following Zigon’s suggestion to limit the study on moralities to what he calls the moral breakdowns, I observed how each state actor stepped away (or did not) »from the unreflective every day and think through, figure out, work on their selves and respond to certain ethical dilemma, trouble and problems« (ibid. : 140). This ethnography is therefore also an example of how everyday life in the facility has been disturbed and denied for a certain group of people — for Syrians. Minors’ agency is not only effective in reproducing or in changing the structures within which they act but also serves as a tool to achieve freedom of choice regarding their lives. Escaping from war and the refugee camp, looking for a school, are not only structurally or transformatively important and powerful, but are also expressions and manifestations of the search for freedom, and, most importantly, they are ways to obtain self-reliance and independence. Unlike Laidlaw, who separates agency and freedom, in the Syrian minors’ case, agency is inseparable from the way to freedom. Freedom does not necessarily offer criteria for its full realization, but, by acting on the grounds of free will, minors did achieve an exercise of it (Laidlaw 2002: 323). The state itself has shifted from humanitarian aspects towards a more controlling and authoritarian stance, as the new policy denied minors’ rights for the sake of protecting European borders. Prior to the deal, Syrian minors were received by state care institutions, just like the other nationals. However, after the deal, compassion and caregiving left its place to suspicion concerning the minors’ legitimacy for becoming unaccompanied minors who should be given equal rights to education and access to social services. Demonstrating the emerging suspicion, a social worker at the camp stated, »Mostly the child lies about his family background and lies about their whereabouts.« Previously, in a similar conversation with the administration back in ÇOGEM in Istanbul, they also mentioned how families actually send away their children to state care facilities on purpose so that the state takes care of their education and needs. »Most of them, they use us and take advantage of us,« said the social worker at ÇOGEM, right after asking me for my opinion on the following question: »Aren’t we too normal anyway?«. Extremely surprised and not knowing how to react, I asked: »In what sense?«. The social worker repeated the question, »Aren’t we too normal for a place like this?«. Here, in such a place, where the state of exception becomes the rule (Fassin 2005: 377), the abnormal has been normalized as the everyday of the institution is kept going, even at times of moral breakdown (Zigon 2007). Moreover, the whole relationship and interactions with the minors have all been exercised under great confusion. This is the main reason why I defined the moralities of the state ›confused moralities‹ at the beginning of the article. These ›confused moralities,‹ among other, resulted in the exclusion of minors. Hence, as a way out, minors respond to exclusion and try to escape from it in their search for freedom. Arendt, Hannah (1972): Crises of the Republic. San Diego. Berlin, Isaiah (1969): Four Essays on Liberty. Oxford. Carter, Ian (1999): A Measure of Freedom. Oxford. European Commission (2016): EU-Turkey Statement. Questions and Answers. Factsheet on the EU-Turkey Statement. 19.03.2016. URL: europa.eu [01.08.2017]. Fassin, Didier et al. (2015): At the Heart of the State. The Moral World of Institutions. London. Fassin, Didier (2013): On Resentment and Ressentiment. The Politics and Ethics of Moral Emotions. Current Anthropology 54 (3). 249–267. Fassin, Didier / Kobelinsky, Carolina (2012): How Asylum Claims Are Adjudicated. The Institution as a Moral Agent. Revue Francaise de Sociologie 53 (4). 444–472. Fassin, Didier (2005): Compassion and Repression. The Moral Economy of Immigration Policies in France. Cultural Anthropology 20 (3). 362–387. Fernando, Mayanthi / Giordano, Cristiana (2016): Introduction: Refugees and the Crisis of Europe. Hot Spots, Cultural Anthropology website of 28.06.2016. URL: culanth.org [28.06.2016]. Foucault, Michel (2000): Essential Works of Michel Foucault, Vol.1: Ethics: Subjectivity and Truth (P. Rabinow, Ed.). London. Foucault, Michel (1977): Discipline and Punish: The Birth of the Prison. London. Harper, Douglas (2002): Talking about pictures. A case for photo elicitation. Visual Studies 17 (1). 13–26. Heidegger, Martin (1953): Being and Time. Albany. Jesuit Refugee Service Europe (JRS Europe) (2016): The EU-Turkey Deal. Analysis and Considerations. Jesuit Refugee Service Europe Policy Discussion Paper. URL: jrseurope.org [02.08.2017]. Laidlaw, James (2002): For an Anthropology of Ethics and Freedom. Journal of the Royal Anthropological Institute 8 (2). 311–332. Santer, Kiri / Wriedt, Vera (2017): (De-)Constructing Borders. Contestations in and around the Balkan Corridor in 2015/2016. Movements Journal 3 (1). 141–150. Schensul, Jean / Berg, Marlene / Schensul, Daniel / Sydlo, Sandra (2004): Core Elements of Participatory Action Research for Educational Empowerment and Risk Prevention with Urban Youth. Practicing Anthropology 26 (2). 5–9. Soykan, Cavidan (2017): Turkey as Europe’s Gatekeeper. Recent Developments in the Field of Migration and Asylum and the EU-Turkey Deal of 2016. In: Hess, Sabine / Kasparek, Bernd / Kron, Stefanie / Rodatz, Mathias / Schwertl, Maria / Sontowski, Simon (Eds. ): Der Lange Sommer der Migration. Grenzregime III. Berlin, Hamburg. 52–60. Tibet, Eda Elif (forthcoming 2018): Learning as Agency: Strategies of Survival among the Somali Unaccompanied Asylum Seeking Youth in Turkey. In: Bhabha, Jacqueline / Senovilla Hernandez, Daniel / Kanics, Jyothi (Eds. ): Handbook on Migration and Childhood. Northampton. Williams, Bernard (1972): Morality. An Introduction to Ethics. New York. Wissman, Kelly / Staples, Jeanine / Vasudevan, Lalitha / Nichols, Rachel (2015): Cultivating Research Pedagogies with Adolescents: Created Spaces, Engaged Participation, and Embodied Inquiry. Anthropology & Education Quarterly, 46(2). 186–197. Zigon, Jarrett (2007): Moral breakdown and the ethical demand. A theoretical framework for an anthropology of moralities. Anthropological Theory. 7 (2). 131–150. Eda Elif Tibet is a PhD Candidate on Social Anthropology, University of Bern & Research Assistant at PH Bern (Pädagogische Hochschule) and an independent documentary film-maker who has made award winning participatory films with her refugee friends that made it to many film festivals. The research is part of an ongoing doctoral dissertation, a joint collaboration between the University of Bern’s Social Anthropology department and PH Bern. The research project is called Transnational Biographies of Education: Young Unaccompanied Asylum Seekers and their Navigation through Shifting Social Realities in Switzerland and Turkey and is funded by the Swiss National Science Foundation. It is supervised by Prof. Dr. Sabine Strasser and Prof. Dr. Kathrin Oester.